I’d like to give our friends in Denver a quick overview of the fuel system. It starts with the fuel pump. The fuel pump is located inside the tank and pumps the fuel out to the engine. Somewhere along the way is a fuel filter, it has the job of filtering out dirt before it gets to the engine. Our focus is to discuss how to make the various components of your fuel system work well and last as long as possible. Now the best thing you can do for your fuel pump is to use good quality fuel. Top tier gas typically has fewer contaminants and more detergents to keep things clean. Using good gas, or adding a fuel system cleaner to your tank, can prolong the life of your fuel pump. Because the fuel pump lives inside your tank, it’s pretty expensive to replace, so helping it last as long as possible is a worthwhile goal. The fuel filter catches dirt and contaminants. When it’s clogged, your engine may not be able to get enough fuel and could start to sputter. Many fuel filters have a bypass valve that allows unfiltered fuel past when the filter’s clogged. This prevents your engine from dying while you’re driving, but it can’t protect your engine from dirty fuel. Check your owner’s manual or talk with your service adviser at Express Car Care about when you should replace your fuel filter. Fuel will cause gum and varnish to build up in the fuel intake system. A professional fuel system cleaning will remove the gunk to keep fuel flowing freely and help prevent contamination from reaching your fuel injectors and your engine. Fuel injectors squirt fuel into the engine and the fuel must be delivered in a precise amount, at a precise time, under exact pressure, in an exact pattern. Pressure can range from 45 pounds per square inch to 45,000 pounds per square inch depending on the engine. As you may guess, fuel injectors cost a lot to replace. Allowing them to get gummed up will not only hurt your engine performance and fuel economy, it will also cause the injectors to wear out much more quickly than expected. A professional fuel system cleaning will keep injectors clean and working correctly. It’ll also clean deposits from the inside of the combustion chamber and off the intake valves, giving you optimum performance and mileage. Check with your service adviser and see when he recommends you have a fuel system cleaning. What do you know about your car’s fuel system? For most people, probably not much more than heading to the gas station and filling up the tank with fuel. Yet your fuel system is actually a sophisticated system that keeps your entire automobile in good working condition. Think of it as the food to keep your car running. If any one of the parts breaks down, your engine will not run. 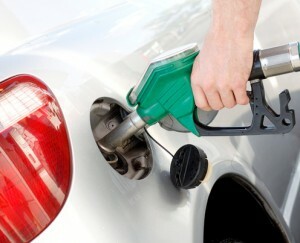 Fuel tank: Your car’s fuel tank is the holding tank for fuel. When you fill up at the gas station, the gas travels down through a filler tube into the tank. A gauge in the tank tells the system how much gas is in the tank. Fuel pump: Fuel pumps can be located in different areas on your car, depending on its age. On newer cars, the fuel pump is usually installed in the fuel tank. On older vehicles, its attached to the engine or on the frame rail between the tank and the engine. Pumps in the tank or on the frame rail are electric and run by your car’s battery. Pumps mounted to the engine use the motion of the engine to pump the fuel. 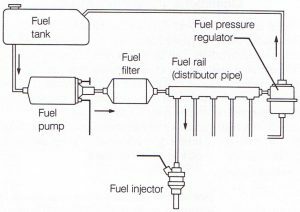 Fuel injector: The fuel injector is a tiny electric valve which opens and closes with an electric signal, letting fuel into the engine. By injecting fuel close to the cylinder head, the fuel stays atomized so it will burn better when ignited by spark plugs. Fuel filter: Just like you wouldn’t drink dirty water, your car can only handle clean fuel. Fuel injectors have tiny opening which clog easily. A fuel filter is designed to separate out tiny particles that may harm your engine. What can go wrong with your fuel system? The most common problem is a clogged fuel filter. These filters need to be changed on a regular basis, or according to your driving conditions. You can usually tell if your fuel filter is bad if you here sputtering at high speeds or the engine won’t start. The next most common problem is the fuel pump failing. When you start your engine, you can hear the pump. If you don’t hear it, your car won’t start. An auto mechanic will check the relay, which sends power to the pump. If this is in good working condition, the fuel pump will have to be replaced. Finally, even the the fuel filter does a good job of filtering fuel, its not perfect. Over time tiny particles will lodge themselves into the injectors. Eventually these may clog, preventing the delivery of fuel the engine needs to operate. Watch where you buy your gas. Yes, off-brand gas stations usually end up with leftover supplies, meaning their gas comes from a variety of sources. And in some cases, water may be added to the gas they supply, which immediately can cause problems with your system. Stick with the brand name gas stations. Fill the tank with proper gas octane ratings. Your owner’s manual will suggest a proper octane level to maintain your engine. Stick with this rating. If it says 87 octane, do it. No sense in putting in premium unless its specifically recommended for your vehicle. Be proactive with your maintenance. If you work regularly with an auto mechanic, he can recommend maintenance before you have buildups and break downs. A fuel line flush can save you money on more severe problems later on, but only if they catch it in time.